A mother's free time is precious and she chooses what she does with this time carefully and skillfully. Taking advantage of technology, more moms own smartphones (90%) than computers (89%) and a large number (72%) have tablets, allowing them to easily access digital content anytime, anywhere. In POPSUGAR Insights #Momstamina study, we wanted to know what type of content moms prefer during their "me time." 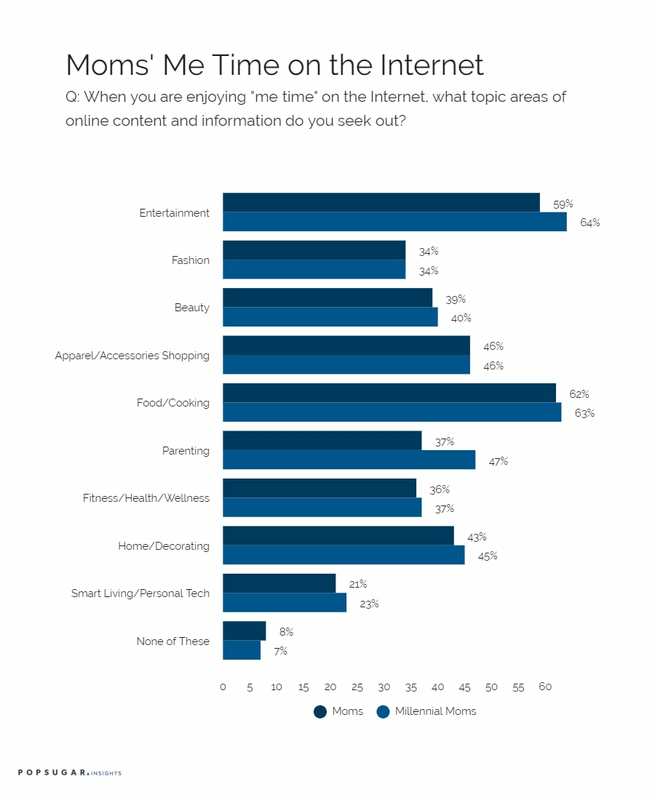 A majority of moms seek out entertainment (59%) and food/cooking content (62%) when they're relaxing with digital content.They're also shopping for apparel and accessories (46%) but not necessarily perusing the latest fashions, as only 34% cited fashion as a topic they enjoy during their free time. Even during their downtime, moms are viewing parenting content (37%), and millennial moms, who very well may be first-time moms, are even more inclined to view parenting content (47%). Millennial moms are also more apt to seek out entertainment (64%) and home decorating content (45%) over the general mom population. Only one-third of moms consume fitness/health/wellness (36%) content via their "me time" and the low interest could be related to the fact that 53% of moms cite a lack of energy and 37% of moms cite a lack of time as reasons why they don't work out more. There's an opportunity here for marketers to provide useful, motivational, fitness content to help them maximize their time and inspire them to continue on their wellness or fitness journey. All in all, 90% of moms are using the time they spend with digital content as a respite from their day to day responsibilities, or as ways to make their precious free time more productive. Digital lifestyle content is an important part of their "me time."